Nouveau Pinot Wine drinkers are familiar with Beaujolais Nouveau, traditionally released today, the third Thursday of November to celebrate the year’s harvest. Now that the novelty of Pinot Noir Blanc has worn off, Pinot Noir producers are turning to another option, “Pinot Nouveau.” For the past three years, Poe has being making a Pinot Nouveau from Pinot Noir instead of Gamay, using the same winemaking techniques of Beaujolais Nouveau including carbonic fermentation. 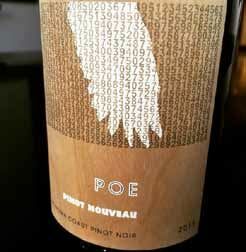 The 2015 Poe version from Sonoma Coast grapes was released about the same time as Beaujolais Nouveau in time for Thanksgiving ($22). The grapes were sourced from dry farmed and head trained Olcese Vineyard in Sonoma planted to Martini clone in 1974. Whole clusters are put in a portable fermenter and the lid sealed for 7 weeks. Absent oxygen, the grapes undergo carbonic fermentation and malolactic fermentation at the same time. The grapes are then pressed and go to barrel for 1 week. The wine is hand bottled without any sulfur as the wine is to be consumed within the next 2 to 3 months. Meiomi Wines also released a Pinot Nouveau labeled as Nouveau Jeunesse with the 2015 vintage now available in wide distribution including Trader Vic’s stores ($18.99). This wine is made from the same grapes that are picked for Meiomi Pinot Noir from vineyards throughout Sonoma, Monterey and Santa Barbara counties. Immediately after fermentation, the wine is bottled and shipped straight to market. It is meant to be enjoyed young and not cellared. Byron Undergoing Transformation Byron is shedding its more popularly priced appellation wines that will now be under a new label called Nielson and are returning to their original focus on small bottlings of single vineyard Pinot Noir from premium Santa Barbara County vineyards. 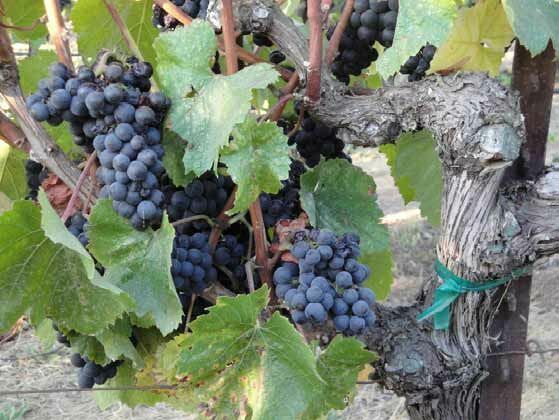 Besides their iconic estate Nielson Vineyard and flagship Santa Maria Valley vineyards (Bien Nacido and Julia’s), winemaker Jonathan Nagy of Byron will also produce single vineyard Pinot Noir from Sta. Rita Hills sites including John Sebastiano, Rita’s Crown and La Encantada. The new Byron wines won’t be released until next year in the early fall. Umpqua Winemaker Raises $1 million in Crowd Funding for New Pinot Noirs Winemaker Scott Kelley, formerly the winemaker for Robert Mondavi Family Wines and Estancia, has struck out on his own and using a crowd funding platform to launch a southern Oregon winery featuring Pinot Noir. He is using NakedWines.com which supports the independent wine market. Winemakers are invested in by the consumer, the so-called “angel,” and in return, they get dibs on delicious wines at wholesale prices delivered to their door. The investment of $40 a month in NakedWines as an “angel” goes toward a wine purchase and the company then invests that money in top winemakers who make wine exclusively for NakedWines.com. Winemaker Scott Kelley has raised more than $1 million on the NakedWines.com site to start his own label. Visit www.nakedwines.com for further details. Scott Kelley and Dyson DeMara (HillCrest Winery and Distillary) plan to make Pinot Noir, red Bordeaux blends, Syrah, Chardonnay and Riesling at Paul O’Brien Winery in Roseburg, Oregon, under the Paul O’Brien Winery label. The two have been friends since 1999 when they met at Robert Mondavi Winery. Paul 0’Brien Winery is the first urban winery in the Umpqua Valley. Wine Kloud Wine industry distributor veterans Darian Wilson and Rich Martini co-founded Wine Kloud, a consumer friendly website that curates the best wine deals available nationwide. The site is linked to over 1,000 retailers and publishes between 200 to 600+ new deal daily. No one else is doing this for consumers. Wine Kloud is not a retailer, but rather a place where consumers can find the best deals on wine. Users browse on Wine Kloud and then buy direct from the selected retailer who is offering the daily deal, at no added cost. Users can set up a profile of personal searchers, as well as track wines and retailers of their choosing via the “wine tracker” and “alert settings,” and be notified immediately when their favorite wines and retailers hit the Deal Kloud. Think of it as the well known version of Slickdeals for purchasing wine. Slickdeals has become the leader in doing the same thing for electronics and now has over 5 million users. Premium membership is a nominal $25 a year and allows users to access even more daily deals, featuring wines with the highest scores and biggest discounts. Another Paris Judgment Movie The 40th anniversary of the Judgment of Paris occurs next year and a new movie claims to be the definitive film version of the Paris tasting. Writer Robert Kamen, a wine producer in Sonoma is beginning a search for actors. New Wine Series, “Uncorked” Esquire Network opened “Uncorked” on Tuesday, November 10. Based on the documentary “SOMM,” “Uncorked” chronicles the journey of six of New York’s hottest wine stewards as they attempt to pass the Master Sommelier test. For full episodes, clips, and photos, visit http:// tv.esquire.com/ekit/uncorked/#/. Each hour-long episode of this six-part docu-series will feature the wine stewards swirling, smelling and slurping a multitude of wines, and they also enter competitions overseen by Master Sommeliers. Only 230 people worldwide have passed the Master Sommelier test in its 40+ year history. 2015 California Winegrape Harvest Early and Light Despite reduced crop size compared to 2014, harvested grapes were of exceptional quality. According to the Wine Institute, 2015 was one of the earliest seasons on record. A mild winter caused early bud break, followed by protracted bloom and unseasonably cool weather in the spring, contributing to smaller grape cluster and variable crop size. Pinot Noir yields were especially low (see chart below). A compacted harvest began in July for sparkling wines and some still white wines, and was finished by most wineries by the end of September. This is only the third time since 1982 that harvest finished in September. Most vintners who were interviewed claimed that 2015 was a vintage of exceptional quality throughout California. The crop is estimated to be nearly 3.8 million tons. Latest Oregon Stats Amaze Latest statistics from Oregon compiled by the Southern Oregon University Research Center were reported in Oregon Wine Press (November 2015) by David Bates. Among the eye-opening numbers were the following. Overall production in 2014 was over 78,000 tons which represents an increase of 39 percent over 2013. This was the third consecutive year of double-digit gains. Pinot Noir production in 2014 was 45,239 tons, an increase from 32,239 tons in 2013. The total number of wineries grew to 676 and the number of vineyards topped 1,000 for the first time (1,027). Of the 27,390 acres planted to wine grapes, 15,356 acres were planted to Pinot Noir. Oregon now commands the highest averageper- bottle price of any wine region in the world ($15.59 compared to a nationwide average of less than $7.00). Chef Guy Fieri Enters Pinot Race According to gq.com, noted Food Network personality and restauranteur, Guy Fieri (“FEE-eddy”), who lives in Santa Rosa, California, has a wine label, Hunt & Ryde, named for his two sons, Hunter and Ryder. He plans to release three varietals including a Pinot Noir this fall and will add a sparkling rosé next year. The wines will be sold on the website, scheduled to go live around Thanksgiving. Fieri’s attempt to open a tasting room near his estate vineyard adjacent his home was opposed by his Willowside neighbors and was turned down by the planning board. Fieri’s winemaker partner on the project is respected Russian River Valley vintner Guy Davis of Davis Family Wines. Hudson Ranch to Add a Winery According to napavalleyregister.com (October 7, 2015), Carneros winegrower and produce farmer Lee Hudson is going to build a winery on his 167-acre property along Carneros Highway. 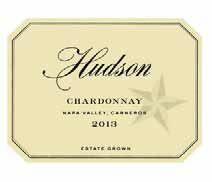 Hudson has farmed in Carneros since 1981 and Hudson Vineyard designated Chardonnay in particular is highly sought after. The winery will include a tasting room so Hudson can accept visitors, taste Hudson wines, and he can build his brand. Hudson Wines at www.hudsonranch.com. Willamette Valley Vineyards Offering Stock in New Winery An offering registered for sale to Oregon and Washington residents only, allows consumers to buy stock in a new winery adjacent Elton Vineyard. The boutique winery will feature a by-appointment tasting room and will specialize in Pinot Noir and Chardonnay made by consulting winemaker, Isabelle Meunier. Preferred stock at an offering price of $4.25 per share earning a 5.2% annual dividend is offered until December 31, 2015, when the share price will increase. For more information regarding the winery and an investment, visit www.wvv.com/ownership.